Caterpillar has expanded its hydraulic excavator (hex) product line with the addition of three new models, which will be available in the Middle East in the second quarter of 2018. The company unveiled its next generation 20-ton size class excavators – the 320 GC, the 320, and the 323 – during a press event held at its Malaga Demonstration and Learning Centre (MDLC) from 9-11 October, 2017. According to the company, the 320 GC model is designed for low- to medium-duty applications, while the 320 is intended for medium- to heavy-duty applications. 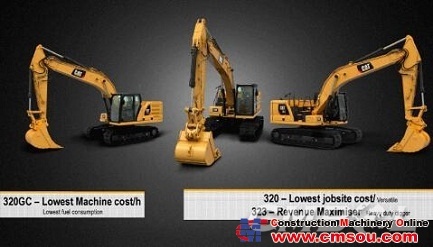 Of the three models, the 323 offers the most power and lift capacity, promising maximum productivity at the lowest possible cost, said the company. Both the Cat 320 and 323 excavators are equipped with integrated Cat Connect Technology, which reportedly increases operating efficiency by up to 45% over traditional grading operations. The products’ Cat Grade with 2D system offers guidance for depth, slope, and horizontal distance to grade, helping operators achieve their target grade quickly and accurately, the company noted. The 2D system comes with an E-fence feature, which prevents any part of the excavator from moving outside operator-defined set points, boosting operational safety. The standard 2D system can be upgraded to Cat Grade with Advanced 2D or Cat Grade with 3D. Other standard features of the Cat 320 and 323 include Standard Grade Assist and the Cat Payload on-board weighing. The former automates boom, stick, and bucket movements, allowing operators to stay on grade with single-lever digging, while the latter is expected to deliver precise load targets and increased loading efficiency with on-the-go weighing and real-time payload estimates without swinging, to prevent truck over/under-loading. Claiming 25% less fuel consumption compared to previous models, Caterpillar has installed the three new excavators with engines that provide power ratings from 107 kW to 117 kW. Moreover, operators have the option to turn on the range’s new smart mode operation feature, which will automatically match engine and hydraulic power to digging conditions. Engine speed is also automatically lowered when there is no hydraulic demand. Further boosting the products’ fuel efficiency is a new cooling system. The system, according to the company, employs multiple electric fans that independently monitor hydraulic oil, radiator, and air-to-air aftercooler temperatures to deliver the exact airflow required. Caterpillar revealed that with a new hydraulic system built for responsiveness and efficiency, the 320 GC, 320, and 323 all feature a new main control valve that eliminates the need for pilot lines, reduces pressure losses, and lowers fuel consumption. Fewer hydraulic lines on the excavators results in 20% less oil required, lowering long-term operating costs, the company added. Caterpillar’s next gen hex range also features a new hydraulic return filter that boasts a 3,000-hour service life, a new air filter with integrated pre-cleaner and primary and secondary filters that extend service life to 1,000 hours, and a new fuel tank cap filter that extends service life to 2,000 hours. Addressing those in attendance at the event, Damien Giraud, vice president of Caterpillar’s construction and infrastructure industries, commented: “Each component that you will find in those machines can be programmed for efficiency, for extra productivity, for better fuel consumption, and for more safety. “Another point I would like to make […] is that this platform is a true global platform. The only thing you will see changing from one region to [another] is the engine arrangement because regulations are different depending on where you are in the world, in terms of emissions regulations, but the machine itself, the technology itself, [and] all of what is going to create customer value [are] exactly the same.